Fiona is a 6 month old Rottweiler puppy, who epitomizes the positive qualities that anyone would want in a puppy… she is happy, friendly, & very bright! 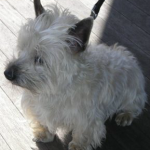 Her owners contacted me for in-home dog training in Bedford NY. My specialized program is designed for puppies and adult dogs of all breeds, ages and sizes. Fiona’s training focused on: housebreaking, puppy biting/mouthing, leash walking, crate training, and beginner obedience training. In this video, I am teaching Fiona impulse control & to “Stay” in command while I walk away and present distractions (opening car door & brining out toy). These are VERY important concepts every dog needs to learn. The toy reward and game play are her rewards for doing such a great job! Here is what Fiona’s owner has to say about our training: “Steve has done an excellent job helping us train our Rottweiler puppy to be obedient. He is very thorough and patient with all the questions we have. Would highly recommend to all dog owners.” – Rachel C.
– Establishing much needed structure and boundaries in Teddy’s daily routine. finds in the home or on a walk). he already has in his mouth). Resource guarding can be dangerous for humans and other animals, so it’s important to work with a qualified dog trainer in Bedford NY or a professional in your area. You do not want to try and train a dog that is showing any signs of aggression on your own – consult with a dog trainer who has a successful track record of working with aggressive dogs. We needed plenty of dog/people distractions to solve his leash walking issues, so we went to a busy track and field for obedience training. Using my specific leash walking protocol, we were able to take Teddy from the leash pulling, barking, and lunging dog that he was, to a calm and relaxed dog walking politely on leash in just one training session. Teddy’s owner learned the proper technique, body position, concept of timing, and how to read his body language very quickly. These results are not unusual, even if your dog has been displaying certain undesirable behaviors for years, we can make significant improvements using a simple, fair, and effective dog training system. Nanook and Kodiak were two out of control Huskies. They were VERY big leash pullers (which made it difficult for their owners to walk them), had housebreaking accidents on a daily basis (they were adult dogs, not puppies), they destroyed their owner’s couch and woodwork when left home alone, and would run away if unleash in the yard or if they escaped through a door. This was certainly a multifaceted case that most dog trainers in Bedford NY would not even take on, however I embraced this opportunity to help them make dramatic improvements. By using the correct techniques, concepts, and body position, we were able to solve their leash walking problems very quickly. We got them to the point where one person could take both dogs for a walk at the same time. We addressed their housebreaking issues and tendency to destroy items in the home by establishing a set routine and management plan. Establishing a routine and plan is very reassuring to dogs, and gives the owner piece of mind in knowing that they will not arrive home to find their house a mess and soiled. Having a Structured Crate Protocol is essential when it comes to dealing with behavior issues like this. In order to help with Nanook and Kodiak’s “Houdini” like ability to escape and run away, we focused on improving their overall obedience commands and recall (“Come” command). 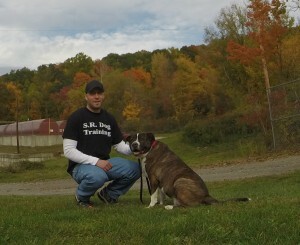 By training the recall and obedience training in Bedford NY, ensures that they stay there. Huskies have a natural tendency to travel long distances. 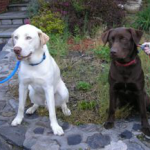 Even though this is a complex case, with the right dog training and obedience training system, we were able to achieve a harmonious outcome for both dog and owner.